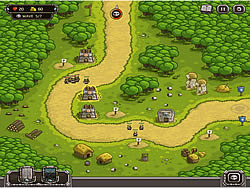 Defend your kingdom from enemy’s attack by building towers to attacking them. Defend your territory against hordes of evil wizards, orcs, trolls and other nasty fiends; armed with a mighty arsenal of combatant, don’t let them pass your defenses. Don’t forget that artillery damage is uppermost in the center of the explosion.